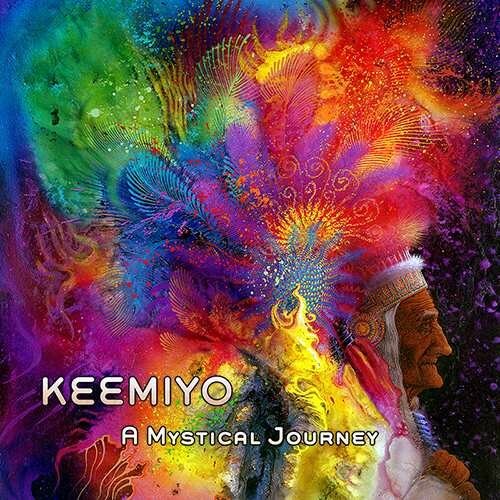 Keemiyo is often mentioned by those in the know as one of the best kept secrets of the progressive trance and psychedelic ambient music scene. If you’ve never heard of him and are wondering what all the fuss is about, one listen to his latest opus on Altar Records (entitled "A Mystical Journey”) will surely make things clearer. Hailing from Madrid, Spain, José Fernandez Romay (aka Keemiyo) is old-school in the best sense of the word. Keemiyo started his musical career playing electric guitar back in the heady 1970's. A visit to India in 1978 landed him smack dab in the middle of the burgeoning psychedelic rock, open-air party scene happening in Anjuna Beach, Goa. That’s where post hippy Westerners were going to ‘turn on, tune in, and drop out’. The colorful and mind expanding experience and sense of community he found there definitely transformed his musical journey for the better. This was a place where nature, technology, counter-culture, art and music intersected on the cutting edge. More to the point, he became a pioneering member of a movement that later on transformed into the original Goa Trance parties -the birthplace of modern Psy Trance and Psy Chill. Back home in Spain in the early 90´s, he found himself naturally drawn to DJing, where he participated as a resident DJ for a variety of clubs, offering an eclectic mix of music including Dub, Break-beat, and of course Trance. Wanting to take things further, in 2002 he jumped even deeper down the rabbit hole and started studying to be a sound engineer. That gave him the ability to realize his musical ideas by working with what was (at the time) a revolutionary new set of tools: VST plug ins and computer based DAWs like Logic and Cubase, in conjunction with analog synths; he also added his own unique, organic touch via guitar, flute and percussion. He’s been producing consistently since then, with an entire catalog of releases and collaborations to his name, and plays the festival circuit regularly. That he also plays the flute beautifully means comparisons to Raja Ram are, perhaps, inevitable, and in fact the two come from the same lineage and know each other well. One of the interesting things about Keemiyo is that even though he’s from the old-school, he’s managed to bridge to the new-school so well, and his releases are regularly featured or mentioned alongside modern luminaries such as Suduaya, Astropilot, E-Mantra and Blue Lunar Monkey. He’s also done numerous collaborations on chill tracks with his mate Raul Jordan (aka Lab's Cloud) and with various artists like Alchemix, Psycho_Abstract and Quantica. In fact, Keemiyo’s releases have been featured on labels such as: Altar, Ovnimoon Records, Flying Spores Records, Psylove Records, and AIAM Project Records - to name a few - for the better part of over a decade. His Music The vibe of the music that he makes is (in his own words): “Music with soul, made from the heart”, and that sums it up perfectly. There’s not a dark, gnarly edge to be found anywhere on this album. That doesn’t mean it’s fluffy or superficial; quite the opposite, as the focus is clearly on mystical spaces, featuring rich harmonies with fat bass lines. Keemiyo’s music also features dreamy atmospheres backed by steady grooves and pulsing percussion, as well as the signature heartwarming flute lines. These are wonderfully crafted songs that are hypnotic, enveloping, soothing, and yet motivating, ensuring maximum pleasure whether you’re listening, driving, or going deep into trance on the dance floor. The album is composed as a progressive journey, starting chill, building up, and then winding down perfectly. All you need to do is press ‘Play’ and enjoy the ride. And what a wonderful one it is! All the required ingredients are in place, and Keemiyo’s maturity as both a producer and person shine through beautifully. Featuring some unique and stunning cover art work, Mystical Journey is a voyage you’re going to want to take often. Respect and admiration for the heartfelt vibes, organic flutes, and smooth progressive beats of Keemiyo are a guaranteed result. Enjoy the Journey!